For our Interaction Design Practice course we were challenged to create a design that would encourage people to take a walk. This project was based upon the CHI 2010 Student Design Competition The CHI problem required that designs address one main theme, from a list, to encourage people to walk. After research and affinity diagramming our team decided to address the problem through a main theme of community, while also secondarily focusing on enjoyment. Our team started by creating a focus group in order to better understand the problem of walking and how it related to our target audience. However, the focus group was halted at the last minute as subjects failed to show up. Instead of letting our work go to waste, our team decided to quickly write a pilot study interview and conduct it that very night. Over the course of the next few days our team also conducted a non-participatory ethnography study on our target audience. With the results of this primary research combined with the secondary research we had been completing, our team created an Affinity Diagram to help us understand where to focus. Two personas and a set of Golden Questions were created to help us through ideation and whiteboarding. Through many design sessions our team came up with multiple concepts. We then used a set of “Lenses” developed by Valerie Casey to help us narrow down our concepts and find the strengths and weaknesses of our ideas. With some expert reviews along the way, our team decided upon a final concept called Zygomote. 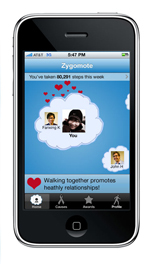 The name “Zygomote” is a composite of two latin bases, “zygo” meaning “to join” and “mote” meaning “motion.” Essentially, Zygomote encourages people (specifically 20-30 year olds) to join in motion and walk together, according to three primary motivations: social bonding, social accountability, and small accomplishments. 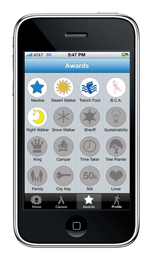 A 2D visualization illustrates the time the user spends walking with friends; the user’s walking activity translates to measurable contributions to charities and causes; and the user frequently earns virtual awards for small feats. 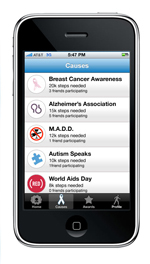 We believe a combination of these three features will encourage individuals to walk one more time. We conducted an evaluation of Zygomote using scenario-based testing on four subjects. Using the scenarios and the ‘think-aloud’ protocol we found that our application was fairly easy to learn and use, although it did contain some usability problems. 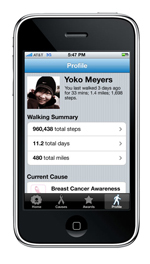 One user in particular commented that our application would defiantly help them to walk more. Furthermore, our team designed strategies to on how to implement, further develop, and sustain Zygomote.